Every child likes to eat snow. And who can blame them? The only reason, as adults, that we don’t eat snow is we don’t want the neighbors to see. Well that’s about to change. 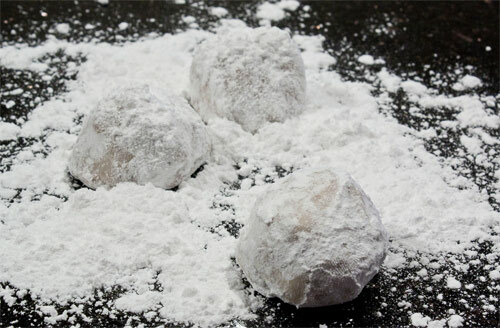 You’ve probably seen these cookies before since they assume several identities – Mexican Wedding Cookies, Princess Tea Cakes, Honey Sandballs – but no matter what you call them, these are perfect for wintertime. Many people will tell you that these cookies can’t be made without butter – they’re wrong. While the flavor or consistency may be slightly different, this heart-healthy version is just as delicious. However, while healthier, these cookies are still high in calories, so if you’re watching your intake, you may want to stick with real snow. 1. Preheat oven to 400°F. Pour oil into a medium bowl. Whisk white whole-wheat flour, 1/4 cup powdered sugar, cornstarch and salt in another bowl. Whisk half the dry ingredients into the oil. Scrape down the sides of the bowl and add vanilla. Mix in the remaining dry ingredients until thoroughly combined (the mixture should resemble creamed butter and sugar). Stir in nuts, using your hands to knead the dough if necessary. 2. Roll the dough into 1-inch balls and place about 1/2 inch apart on an ungreased baking sheet. Bake until the cookies are just set, being careful not to let the bottoms get too brown, 9 to 11 minutes. Cool on the pan for 2 minutes then transfer to a wire rack to cool. 3. While the cookies are still warm, place the remaining powdered sugar in a small bowl and roll the cookies in it, then place back on the rack to continue cooling. When the cookies are completely cool, roll them in the sugar again. Makes about 36 cookies. Growing up, they were my parents favorite Christmas cookie and my least favorite. Now, as an adult, I have come to love and appreciate these cookies and recognize them as a more appropriate (and tastier) way to eat snow. I hope you enjoy them as much as we do! LOVE these, just made pecan ones (and ate one). I love that these are a “healthier” version. I will have to try it. These ARE my moms favorite cookie, I just mailed some to her. I have to try the pecan version sometime but I just love the walnuts so much, perhaps a 50/50 batch! Those look awesome! I can’t wait to be home for christmas and some good sugar cookies. Picked up a jar of Crazy Richards crunchy the other day. Hadn’t had it in a while…so good! I know, I think I was most excited about these and my mom’s gingerbread cookies! They’re so good that she won’t dare modify the recipe since they’ve been a staple Christmas cookie for as long as I’ve been around. Crazy Richard’s (or Krema) is a very good brand, I’m savoring the last jar that Krema sent me! See? Something about them. It’s definitely an adult cookie. Perhaps we should put some rum or whiskey in it too? Why doesn’t peanut butter like Christmas? ‘Tis the season to be jelly! LOL!!!! I thought of you immediately when I heard this one. : ) Merry Christmas! sheesh, i don’t eat snow now only b/c i’ve got tons of nephew and nieces that do that now! :) Fab treat for the holidays! These sound yummy, my family would love them. Haha, I agree – I’m done with snow too, although I saw some snowflakes this morning on the Garden State Parkway that I wasn’t too happy about! I’ve always loved these cookies. I even made them for my daughter’s wedding, where in Alabama, they are a wonderful wedding treat. Thanks for the healthy version! I know, I really want to put peanut butter in them but I don’t want to mess up the consistency! Maybe peanut flour? I need to experiment! oh i was hoping for a pb version also so please do try and experiment w/ a version that does. i must be the exception since as i child i did like these very much. actually the one part of the whole christmas thing that i did enjoy and look forward to. I think it was just me. I was a strange kid. Still am. But I WILL do a PB version soon! Gotta give this snowball recipe a try. It’s awesome, healthy, and it has PEANUT BUTTER! Oh man, yes I do! And thanks for FURTHER pointing out my lack of PB in this recipe! Hi, I did a feature on peanut butter recipes, this week and you are included. Come and visit. Hi! Thanks so much for posting my recipe–I’m very flattered. I do wish you would post the story behing the recipe (as found on Eating Well’s website), though, as it is personally very important to me. Thank you!